Do you enjoy looking at and learning about textiles? The Textile Enthusiasts Group (TEG) was formed to support and foster interest in Asian textiles. Events for TEG members are held monthly from September-May. We invite specialist speakers and practitioners, make visits to textile-related locations, and offer 'hands-on' experiences and demonstrations, for example, in weaving or natural dyes. A popular annual event is 'Shared Passion', a show-and-tell event where members introduce a textile they own and talk about how it was made, how it was or is used, and the story behind its acquisition. Some programs include opportunities to handle, and occasionally, to purchase handmade textiles. You don't need to be an expert to enjoy TEG activities; as our name suggests, we are enthusiasts. We welcome newcomers, so if you're new to Singapore or to FOM, do join one of FOM's most active interest groups. If you'd like to join our volunteer committee, please email for more details. Please note that the TEG annual membership fee of $30 is in addition to annual FOM membership fee. *Not to certain how to use the new activity sign up system click here for full information. TEG is always open to suggestions for textile-related events, exhibitions, and speakers. Textile collectors, artisans and aficionados...We'd love to hear from you! To become a member of TEG, please push the red button below that says "Register by 31 May 2019". It will lead you to a sign up form. Annual TEG enrollment and membership covers invitations to all TEG events and all admissions (unless extra charges apply for private galleries, etc.) plus costs associated with providing this wonderful array of programme offerings. TEG members always look forward to Shared Passion month. This annual show-and-tell event is a wonderful opportunity to share and learn from fellow members. Bring one of your favourite textiles to share with the group -- a piece that is either something you wear or keep as a collector's item. It would be helpful if you know the weaving technique and provenance of your selected piece but if even if you don't, you may have the opportunity to draw upon the knowledge of other members. Each member will be given a chance to speak about their textile piece. Please note that it is not required to bring a textile piece; you are still welcome to attend for the learning experience. Hostess: Kim Arnold. The address will be sent via email to registered participants. Traditional motifs and patterns in Indian block printed textiles tell tales of culture, faith, religion, land and power. A single zigzag line print symbolizes river for one and hills for another. Let’s explore their inception, transformation over time and forms, as we see them today. With over two decades of engagement in the Indian block printed textile sector, Alpna Swarup is eager to discuss her learnings and inferences with TEG members. Having also worked with artisans & craftspeople at grass roots level, what she hopes to bring us is an understanding of the cultural aspect of this visual language. Unseen lanes, unseen rules, heart-skipping beats… before opening the door. You shall find your own and open the door! FOM members are welcome to join the Textile Enthusiasts Group Facebook page. You'll find info on TEG events, as well as other interesting textile news and tidbits. This is where we will post photos from TEG events and share any follow up information from TEG speakers and friends. We encourage you to share textile-related information with other members. We look forward to seeing you there! Curious about what topics TEG meetings have covered? Click below to download a list of TEG events from previous years. THIS EVENT IS OVER. If you are interested in this topic, you can find the exhibition catalogue here. The inspiration for this talk came from the exhibition: Fashion Victims: The Pleasures and Perils of Dress in the 19th Century at the Bata Shoe Museum in Toronto, Canada in 2015. In this illustrated talk, Margaret White will discuss the effects of the use of chemicals and the mechanical changes in clothing production which altered the natural silhouette of the body. Many have paid a high price to be fashionable. An overview from the 19th century to the present day provides an insight into the fascinating world of the fashion industry. Are we willing ‘fashion victims’ today? Hostess: Janet Stride. The address will be emailed to registered partiticpants. Margaret returned to Australia in 2011 after residing in Singapore for almost 20 years. During that time, she was heavily involved in the rapidly evolving National Heritage Board Museums via the Friends of Museums (FOM) and continues to be engaged with the society. Her passion for Asian art and culture spurred her to complete an MA in Southeast Asian Studies from the National University of Singapore. She has held numerous positions in FOM including the Textile Enthusiasts Committee, Docent Coordinator, Study Tours coordinator and President and Advisor. Travelling extensively through Asia has provided further impetus to collect and study textiles, ceramics and art. Currently, she serves on the Management Committee of The Asian Art Society of Australia where she coordinates both the Textiles Study Group and the Ceramics Study Group. Many of us have heard the term kain limar, which refers to the famous weft ikats from Malaysia's northeast states of Terengganu and Kelantan. 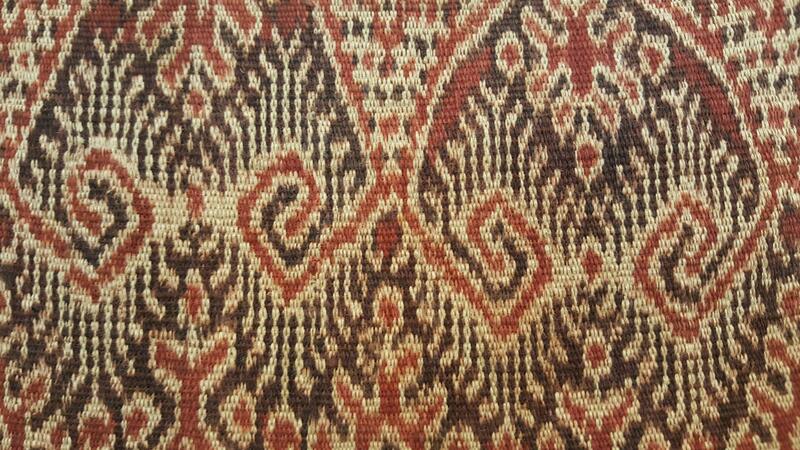 However ikat loseng, a warp ikat produced in the same states of Malaysia, is largely unknown. Textile collector John Ang's interest began with the purchase of his first Malay ikat loseng. Although he told many of his textile collector friends that it was from Terengganu, they insisted it was a warp ikat from Uzbekistan. The similarities between the two were intriguing and inspired him to investigate if there was a connection. His talk will focus on this investigation and its interesting results. Examples from John's private collection will be shown after presentation. Location: Indian Heritage Centre activity room. John Ang is an avid collector of textiles. Since 2014 he has focused on collecting and researching textiles of the Malay world. After 32 years in Taipei, he has recently moved to KL to facilitate his research. He is also accumulating interesting stories about these textiles to compile into a book. THIS EVENT IS OVER. For information on Dr Duggan's recently published book about Savu, please click here. Culture is not a commodity and traditional textiles cannot be reduced to merely their commercial value. In this talk, anthropologist Geneviève Duggan will uncover the invisible power and the unspoken agency of textiles and reveal new ways to appreciate the hand-woven cloths of eastern Indonesia. Dr Geneviève Duggan is an anthropologist and during three decades of research in Indonesia, she has studied textile traditions in social contexts (Ikats of Savu White Lotus 2001) and transmission of knowledge in an oral society (PhD thesis, NUS 2008). From 2010 to 2013 she was a Visiting Fellow at ISEAS (Singapore). Recent publications include Savu; history and oral tradition in an island of Indonesia (co-authored with Hans Hägerdal NUS Press, 2018); A note about hand-woven cloths with a continuous warp in eastern Indonesia (Archipel, 2017); and Tracing Ancient Networks; Linguistics, Hand-woven Cloths and Looms in Eastern Indonesia (Qin Dashu and Yuan Jian eds, World Scientific, 2015). THIS EVENT IS OVER. Event photos can be found on the TEG Facebook page! You can read more about Peter Lee here. Celebrate the festive season with textiles and style! Dress up in your favourite ethnic or handcrafted textiles and join TEG at the elegant home of Peranakan scholar and collector Peter Lee. Peter will have a few pieces from his collection on display for us to enjoy. Spouses are welcome and are encouraged to participate in the 'textile spirit'. This social event is exclusively for TEG members and their guests. Not a TEG member yet? You can join right here on this webpage! Peter Lee is an independent scholar, author, and the Honorary Curator of the Baba House, a historical house museum managed by the National University of Singapore. In 2016, Peter was a guest curator of Port Cities: Multicultural Emporiums of Asia, 1500 –1900. His family's collection of textiles focuses on the links between batik and Indian trade textiles, and how both are very much part of an interconnected history. The collection comprises mainly batiks from the north coast of Java, and Indian trade cloths made for Europe, Japan, Iran, Sri Lanka, and the Malay Archipelago. THIS EVENT IS OVER. You can see more fashion by Kaveri here. Linen is one of the world's oldest and most valued fabrics. Join designer Kaveri Lalchand for a talk about the history of linen, its positive properties and what makes it so appealing...life, like linen, is better relaxed! We will also have a reading of a few poems about women, clothes, shopping and life, plus a discussion of how the clothes we wear shapes us, stereotypes us or leaves us open to judgement from outside and within. A trunk show from Kaveri's clothing line will be on display in conjunction with this talk. Based in her hometown of Chennai, Kaveri Lalchand is a clothes-maker who crafts stylish, impressionable and inherently comfortable clothes exclusively in linen for women across ages and life contexts. She also has an international presence in Europe, Singapore, Sri Lanka, and Maldives. The brand Kaveri is a free-flowing articulation of its maker’s spirit that celebrates the importance of comfortable garments that have the potential to empower women - of all kinds and sizes - to feel beautiful, and loved, everyday. Kaveri is one of Chennai’s prominent theatre actors and is a strong supporter and crusader of traditional Indian craft & textiles and has worked closely with the Crafts Council of India to preserve and promote these art forms. THIS EVENT IS OVER. To see photos of this event and the workshop results, please visit the TEG Facebook page! Please join Kim Arnold for an informal talk on Kumihimo, which will cover its history, techniques and some current uses. These intricate braids have been used for centuries in Japan and are traditionally made with silk threads using specialized stands. She will explore historical uses and discuss methods, materials, stands and shapes. After the talk, interested participants will have the opportunity learn the Edo Yatsu Gumi, an 8-strand braided cord. Kim Arnold is a co-coordinator of both TEG and Asian Study Group. This event will be held in Kim Arnold's home. The address will be emailed to registered participants. THIS EVENT IS OVER. If you missed it, we will offer this same program again next year with the start of the new season! Did you ever wonder what a warp was? Or weft? Are you curious about how ikat is made? Interested in the names and colours of natural dyes? If you are new to the study of traditional textiles or just want a better understanding of some of the terms used by textile collectors and experts, TEG is here to help. Come spend a relaxed morning with Lynelle as she explains various terms to help your understanding and appreciation of textiles. Free for TEG members. Registered participants will receive the venue address via email. Since moving to Asia and joining TEG, Lynelle Barrett has become obsessed with traditional textiles. She now devotes her time to textile art, weaving and teaching. When she can, she travels to learn about weaving and natural dye techniques from indigenous weavers. Lynelle is co-coordinator of the Textile Enthusiasts Group. THIS EVENT IS OVER. Photos from this event are on the TEG Facebook page! For centuries, India has been clothing the world through the export of cotton textiles. The popularity of the material was due to the fabulous colour fast dyes extracted from natural plants and minerals. The beautiful patterns were created by skilled craftsmen through painting, block printing or weaving and advanced techniques of mordant and resist dyeing. This lecture looks at the history of the trade and some of the oldest textiles preserved in museums in Singapore and abroad. Marina Thayil has been an FOM docent since 2008 at the Asian Civilisations Museum and the Indian Heritage Centre. She has completed a Postgraduate Diploma in Asian Art from the School of Oriental and African Art, London.